Although it's technically been fall here in San Diego for some time, it is finally starting to feel like it! I couldn't be happier to welcome fall than with these gorgeous Naughty Monkey "Risk It" boots. Not only are they comfortable, but they conceal the heel (a la Givenchy boots or Sneaker wedges). 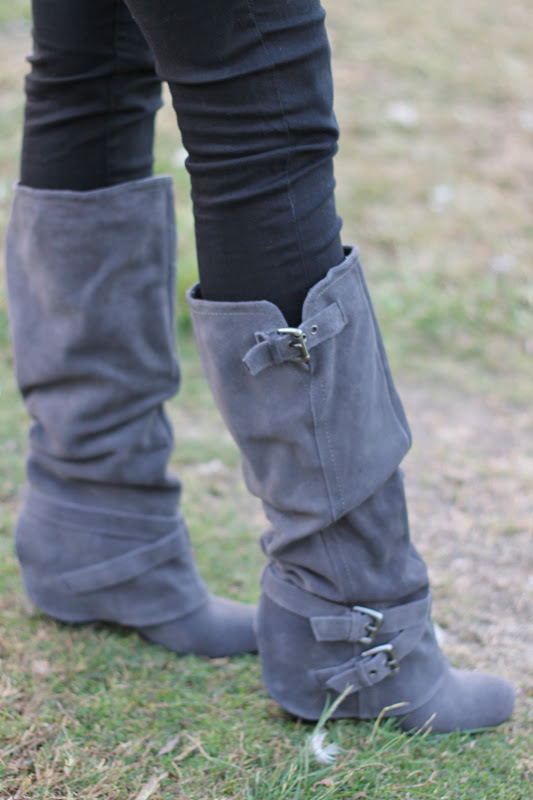 With these cool buckle details and a touch of slouchyness, they are perfect for a casual day of running errands. Técnicamente en San Diego hemos estado en la temporada de otoño por algún tiempo, pero finalmene se está sintiendo! No podría estar más feliz de dar la bienvenida al otoño que con estas botas de Naughty Monkey llamadas "Risk It". No sólo son cómodas, pero esconden el tacon (como las botas Givenchy o los tenis con tacon). Con detalles como las hebillas y esta forma son perfectos para un día casual. Such a cute outfit, great styling! The greys and blacks look so good together and I love the print on your top! beautiful pics! 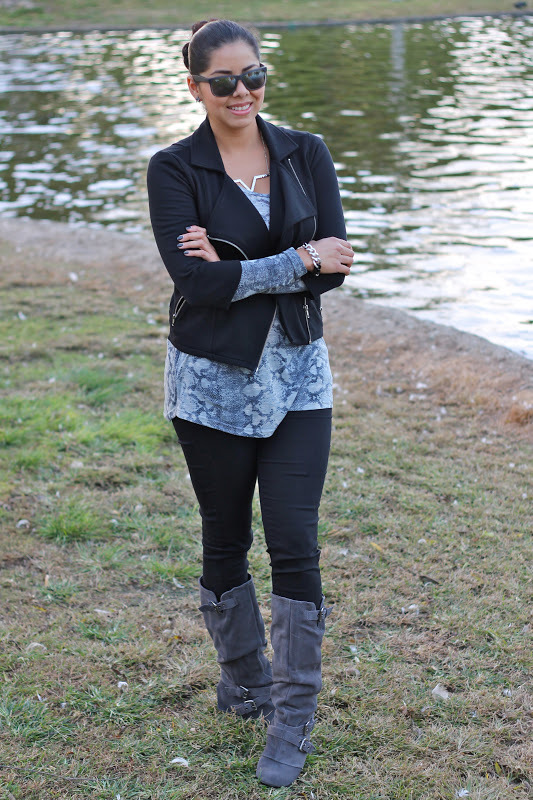 love your jacket and boots! Great outfit for the fall! I'm been trying to go out of the whole black outfit, but your bits of gray and black together look great! Great post. Love that top and jacket. LOVE your fold over boots! Nice look ,i love the boots! Yes sure we can follow each other. Thanks for the comment ony my blog. I am following you now, please follow back..
Qué look tan bonito!, estás preciosa!, Me encantan las botas!. Hi!You have a lovely blog! I'm following you now, would you like to follow each other? LOVE the snake print top & the boots!! im in loveeee with the boots!!!! I love anything animal print and your top is fantabulous! The jacket with that zipper detailing is too too good. It'd be great if you visited my blog too dear. in love with the bootsssssssss!